SERIES 96 Rigid Twin Hooks Load Spreaders are used when loads to be lifted on a single hoist must be picked and supported at two or more suspension points. Listed in this bulletin are two of the more popular types in capacities to twenty tons and lengths or reaches up to twenty feet. These spreaders are assembled to order only from stock fittings and any intermediate reach may be specified. 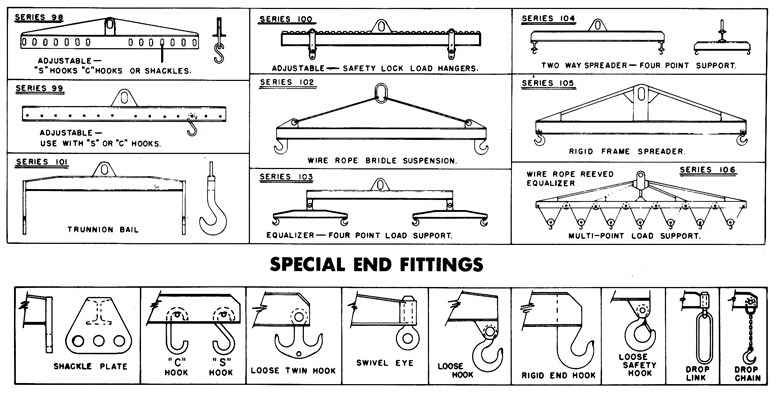 The spreaders as listed may be ordered with extra hooks or fittings installed on the beam for addi-tional load support. When so ordered the hook spacing must be specified and also the type of hook or fitting if other than the standard shown. Load spreaders can be furnished in a large num-ber of practical designs to suit any lifting or han-dling condition. Longer reaches, large capacities and other special constructions will be quoted on request.